If the Condominium Association fails to provide access to the condominium records, then damages can be assessed against the Association under Florida Statute 718.111(12). The law sets minimum damages here as $50 per calendar day for up to 10 days ($500), beginning on the 11th working day after receipt of the written request. Failure under the statute to provide the Official Records is established after a written request was presented to the association, 10 working days has passed without access to the records being provided. About $3.6 million is missing from one of Miami Beach’s bank accounts, leaving administrators and law enforcement agencies scrambling to figure out how it happened, who did it and why no one noticed earlier. In a letter sent Wednesday to the city commission, City Manager Jimmy Morales said he learned earlier this week that someone had accessed bank information for one of the city’s accounts and illegally set up an automatic transfer to other banks. The money moved the way one would set up automatic payments out of a personal bank account to pay monthly bills. Over an unspecified period of time, dozens of transfers from the Beach’s SunTrust account amounted to $3.6 million — taxpayer money that flowed out of the city’s coffers and should have been noticed by the finance department. Morales said the city is the victim of bank fraud and that he doesn’t believe city employees are to blame, but details won’t be clear until the investigation concludes. Two managers in the finance department who Morales said should have noticed the unauthorized transfers resigned Wednesday as Beach police and FBI agents continue looking into what happened. The account that was pilfered, which has since been closed, was a general account used to house money collected from permit fees and water bills. This money goes to pay government bills, such as payments to Miami-Dade County for drinking water. Dollars are also transferred to other city accounts for other expenses, including payroll. Morales said the city has sent claims to the banks that received the transfers to get the funds returned. The compromised SunTrust account is now closed, and a new one with tighter monitoring has been opened. Most automatic payments have been stopped. The city’s staff is now reviewing transactions every day and reconciling all money being paid out in electronic transfers. No money was missing from any of the city’s other accounts, but tighter controls were put on all of them, a city spokeswoman said. According to sources familiar with the circumstances, the managers overseeing accounts payable and the city’s treasury division were forced to resign Wednesday after the money was found to be missing. Morales declined to name the employees. The bombshell revelation comes one year after another unexpected shakeup in the Beach’s finance department. In September 2015, the city’s top two financial officers — longtime chief financial officer Patricia Walker and Georgie Echert, assistant finance director — were forced to resign after the administration learned that they manipulated paid vacation and sick time to benefit future payouts when they left the city. Both hastily submitted resignations scribbled on notebook paper. Late Wednesday, Mayor Philip Levine said that fraud, hacks and identity theft hit individuals and companies alike. (10) Fifteen percent of the total voting interests in a condominium association, or six unit owners, whichever is greater, may petition the ombudsman to appoint an election monitor to attend the annual meeting of the unit owners and conduct the election of directors. The ombudsman shall appoint a division employee, a person or persons specializing in condominium election monitoring, or an attorney licensed to practice in this state as the election monitor. All costs associated with the election monitoring process shall be paid by the association. The division shall adopt a rule establishing procedures for the appointment of election monitors and the scope and extent of the monitor’s role in the election process. City law permits short-term rentals only in certain areas of the Beach. Neighbors blame Airbnb and its competitors for noisy parties thrown by guests. The powerful hotel industry says the services are unfair competition because hosts don’t pay local resort taxes. The Beach has responded by cracking down on illegal rentals with fines as high as $20,000 per violation. On Wednesday, commissioners voted to further tighten regulations on short-term rentals. In order to advertise units on Airbnb and other sites, homeowners will now have to submit an affidavit to the city affirming that their property lies in an area approved for short-term rentals and that they have obtained a business tax receipt and resort tax account. They will also need to show that their condo association allows short-term rentals. Fines for violators start at $1,000. Representatives from the hotel industry and individual condo associations spoke in support of the new rules. But some residents said they should be allowed to rent their units without burdensome regulations. Airbnb, the largest short-rental company, expressed frustration with the ordinance. Single-family homes in Miami Beach are not allowed to participate in short-term rentals, no matter their location. The city has fined residents and rental companies more than $4 million for violating its rules. Short-term rentals are defined as being less than six months and one day. “South Florida is the fraud capital of the country, and we just felt it was putting too much trust in every condo owner, saying, ‘Yes they are going to tell the truth,’” Commissioner Joy Malakoff, a sponsor of the ordinance, told the Real Deal. “If you get an affidavit and a letter from a condo association, we as the governing body of the city feel much more comfortable that they really are allowed to do short-term rentals,” she said. Foreign investors are moving away from buying Miami condos because prices have gotten too high, says Alex Zylberglait, senior vice president of investments with Marcus & Millichap in Miami. Yet foreign capital is still flowing into the region's real estate market. The Daily Business Review spoke with Zylberglait about why. This interview has been edited for length and clarity. You've noticed a trend shaping Miami's real estate landscape over the past couple of years: When condo sales to foreign investors begin to decline, commercial real estate sales to foreign buyers go up. Why is that? For decades, foreign buyers came to the U.S. to buy condos. But a strong dollar and skyrocketing condo prices has been shifting foreign investors' appetite in Miami real estate from residential to commercial. We really began to see this in early 2015, when commercial real estate deals in Miami involving foreign capital jumped to $2.3 billion from $468 million in 2014, according to data from Real Capital Analytics. In 2016, deals involving foreign capital in Miami-Dade totaled roughly $1.72 billion. While this number is down from last year, it remains extremely high compared to 2014, 2013 and 2012. The volume of international investment is down this year compared with 2015. Why is that? While the absolute numbers are down, they're still very strong. 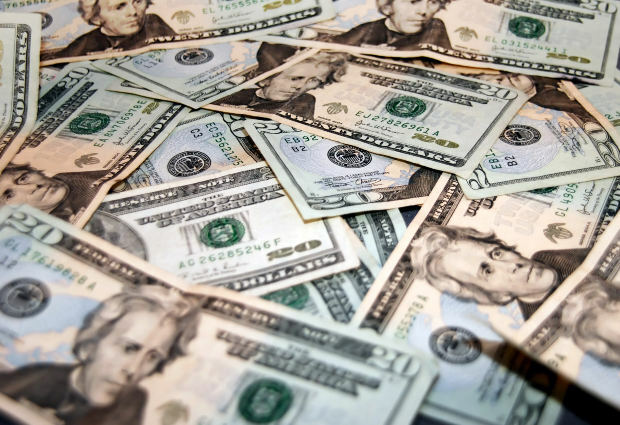 Part of it relates to the fact that the dollar has strengthened against foreign currencies. That has caused somewhat of a pause or slowdown. Nevertheless, the numbers are still healthy. The fact that financing has been available to international buyers more so than in the past has fueled strong foreign investment activity, as buyers are able to leverage their equity and increase their purchase power. Miami's real estate market has grown beyond its luxury condo offerings. What drove this evolution? As the condo pricing got significantly out of balance in mid- to late-2014, we began to see a lot of foreign buyers saying, "I would rather own a commercial asset that's going to give me more predictable cash flows and a higher appreciation potential." Investors who traditionally stuck to the residential market noticed that demand for commercial property was outpacing supply. We began seeing a migration of residential investors into the commercial sector. Between 2009 and 2014, the volume of commercial sales to foreign investors ebbed and flowed, ranging from $71 million up to $714 million. A noticeable shift took place in 2015, when foreign buyers invested over $2 billion in the region's commercial sector, simultaneous to a softening in the condo market. That tells us that foreign capital isn't really leaving Miami, but rather changing the type of asset. For example, I'm working with an Argentinian investor who stopped buying condos last year and is now buying single-tenant, triple-net-leased assets in South Florida. Between 2010 and 2014, he bought three high-end condos. But in 2016, he decided to stop buying condos because he perceived that prices had hit a plateau and wouldn't appreciate much more in the near future. He's actively looking for more single-tenant assets that are easy to manage at a distance, can generate cash flow and are still increasing in value. 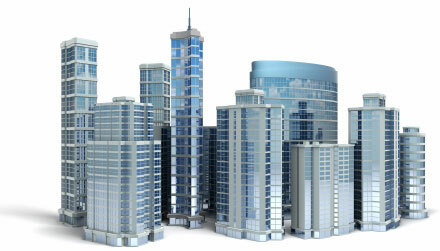 What notable trends have you seen in today's commercial real estate market? We're seeing some segments of the market leveling off in terms of pricing. There has been an unprecedented growth in values up until last year. This year, we're seeing less price appreciation. Miami Beach — a paradise for both tourists and the people who cater to tourists — remains one of the most repressive cities in America when it comes to room-sharing. In most of the city's residential zones, short-term rentals have long been illegal. Lately, the city has dropped the hammer on Airbnb users, jacking up fines to $20,000 a pop this year. The city has levied more than $3.2 million in fines since March. But that's apparently not enough for the city: Miami Beach might soon force short-term renters to check in with the government before advertising any of their properties online. At the city's next commission meeting December 12, commissioners will debate cracking down even harder on the few short-term renters who are able to do so legally. Vice Mayor Joy Malakoff, along with Commissioners John Elizabeth Alemán and Michael Grieco, are proposing that anyone advertising a "transient" (or short-term) rental must first register with the city or else receive a warning. If renters continue to flout the rules, they'll face a $1,000 fine. Commissioners will also discuss a separate ordinance that would use money collected from people caught "advertising" or renting their properties illegally to help the homeless. Advertising, in this case, mainly means using Airbnb. A tenant is suing a Miami condo association over its excessive application and move-in fees, saying they violate state law. The lawsuit is the first of several class-actions that attorneys say they plan to file against condo associations over high fees. In June, the Miami Herald reported that condo boards routinely charge consumers hundreds of dollars more than state law allows. Florida statute caps the amount condos can charge to apply and move in at $100 per person. In a suit filed Friday in Miami-Dade County Circuit Court, August Lasseter says he was billed $625 in non-refundable fees when he signed a lease for a unit at one of the two high-rise towers at Quantum on the Bay last year. The charges broke down to $100 for a background check, $175 for “administrative review,” $125 for registration and $225 for move-in. Attorneys for the board, which was highlighted in the Herald’s initial story as the condo with the highest fees, said they had not yet been served and couldn’t comment. 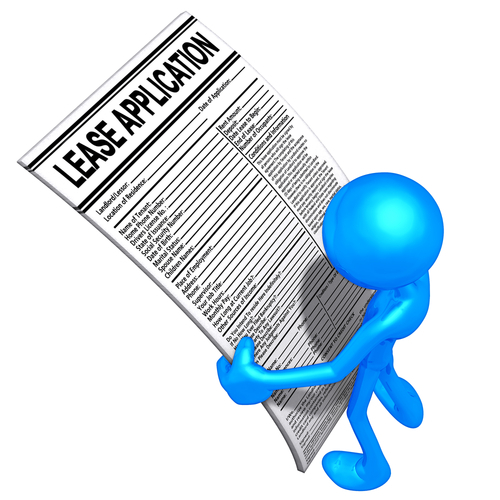 Such fees are known as “transfer” fees because they concern the transfer of a unit from one owner or tenant to another. Resnick is working with South Florida attorneys Joshua Spector and Jonathan Feldman to file more suits across the state. Lasseter’s lawsuit says Quantum’s fees also constitute a violation of Florida’s Deceptive and Unfair Trade Practices Act. It seeks to have Quantum pay damages and restitution to Lasseter and those who join his claim, and asks a judge to stop the association from charging more than $100. Rents at the complex at 1900 N. Bayshore Dr. in Edgewater range from $1,500 for a studio to $4,250 for a three-bedroom penthouse. A Herald analysis of Realtor data this summer found that nearly half of condos listed for sale or rent in Miami-Dade County asked more than $100 in fees. In Broward, 22 percent of condos charged illegally high fees. A search in November showed roughly the same numbers. Property management companies argue the law does allow for charges of more than $100, if the charges come from a third party, not the association. And they say background checks have grown more expensive since the cap was set in 1990. But legal experts consulted by the Herald say the statute is clear and associations are gouging applicants. The Division of Florida Condominiums, Timeshares and Mobile Homes confirmed that the $100 transfer cap is meant to include all non-refundable fees for background checks, registration, move-in, pets, elevator usage and other charges requested by condo boards and their representatives. Background check companies told the Herald they usually charge between $20 and $45 for individual tenant screening, and offer discounts for bulk commercial accounts from condos. But international clients can be significantly more expensive, said Robert Sanchez, vice president of Miami-based United Screening Services. Checks on people from Russia and Latin America, where many Miami condo buyers come from, can range as high as $175, Sanchez said. The extra charges make it even more difficult for locals to find a home in South Florida, already one of the nation’s most expensive housing markets. After the Herald’s initial story came out, José Pazos, who runs a prominent South Florida property management firm, disputed the newspaper’s findings in a Facebook video and said he would lobby the Florida Legislature on the issue. For the past eight months, Miami Beach has waged a war against short-term rentals. Its weapon of choice: $20,000 fines. One property on Meridian Avenue has been walloped three times, totaling $60,000 in fines against the historical five-bedroom home. Owner Daniel Sehres may still be able to circumvent the fines — if he finishes converting the home into a bed-and-breakfast, an option available to him only because he falls into a narrow set of criteria. But the cost to add fire sprinklers, a wheelchair ramp, impact windows and a slew of other requirements that will make the property a legal short-term rental make the fines look like chump change. When renovations are complete, Sehres expects to have paid $200,000 in upgrades. Early this month, the home was in upheaval. Work trucks and crews have been a permanent fixture in front of 1545 Meridian since construction started in August. A ditch at the front of the house is designed to tie it to the city utility in order to install fire sprinklers. The brick in the back patio has been torn apart to accommodate a wheelchair ramp. The drywall is cracked where new impact windows have been installed. For Sehres, it’s worth the expense to stay in the blossoming short-term rental business. Renting, albeit illegally, once helped him come out of the recession after his home was in foreclosure. It gave him independence as an entrepreneur. And it pays: On home-sharing platform Airbnb, the home is going for $1,699 a night. He expects to charge a minimum spend for a maximum five-day stay between $12,000 and $25,000, depending on the season, when the renovations are completed. “This, doing it properly, getting the license, everything, it’s a good business,” Sehres said outside the home earlier this month while construction crews worked. Sehres was hoping to complete the home in time for Miami’s premier art show, Art Basel, this week, but renovations may take longer. During major events, short-term rental platforms have proven popular worldwide because they infuse cities with the extra supply needed to sustain added visitorship. New hosts flood the platforms, looking to profit from the tourist influx. But this year, they will contend with Miami Beach’s new fines for the first time. Potential Basel hosts say the fines and the barriers to access on the beach are exorbitant. Miami Beach’s short-term rental fines are the highest in the country, higher even than New York City, site of one of the most contentious battles against home-sharing. Last month, New York passed a law that penalizes Airbnb hosts who list illegal rentals up to $7,500, less than half Miami Beach’s fine. But the city of Miami Beach feels short-term rentals should play a very limited role in the makeup of the city, where zoning prohibits short-term rentals in almost the entire island, save a few pockets such as a stretch of Harding Avenue and Collins Avenues. Since raising the penalty to a flat $20,000 from a previous cost of $500 to $7,500 in late March, Miami Beach has fined residents and rental companies themselves — including Airbnb, HomeAway and Booking.com — a combined $4 million. Residents who live in areas that allow short-term rentals may also get fined if they don’t have a business tax receipt and resort tax account to operate legally. Tourists staying in illegal rentals can get evicted, but not fined. For residents, the main gripe with sites like Airbnb and HomeAway is their effect on quality of life. Locals have complained that the transient renters often leave units in disrepair, pose unsafe conditions for nearby residents and use the rentals as party houses for their Miami Beach vacations. And they may have a point, Sehres said. “What I’ve learned, even if they say they don’t, everyone comes here to do one thing: party,” he said. Sehres has hosted Japanese bachelorettes and hip-hop artists. A few parties were broken up at his home. Miami Beach code compliance has issued 145 short-term rental violations from March through Nov. 22, said the department’s director, Hernan Cardeno. “More often than not,” Cardeno said, citations are issued because of some type of disturbance, including parties and noise. In May for example, a home at 1575 Stillwater Drive was fined on a second offense for a rental from May 5 to May 8 “due to a bachelor party which cost was $5,000 [sic],” according to complaint records. Cardeno said his department has broken up a short-term rental at a mansion on the beach where the renters were using and selling meth. Alicia Wuscher, a resident who lives on Palm Island, said the house next door to hers on Coconut Lane sees a steady stream of short-term renters who often throw boisterous bashes. The noise gets so loud her house starts “shaking,” she said. Last month, three women staying at a short-term rental on Euclid Avenue found hidden cameras inside three portable clocks in the bathroom. The rental owner, Winston Vargas, was arrested on a charge of video voyeurism. Miami Beach’s short-term rental fines are the highest in the country, higher even than New York City, site of one of the most contentious battles against home-sharing. Its fine is up to $7,500, less than half Miami Beach’s fine. In October, the Miami Beach City Commission approved two additional inspectors and a supervisor for the code compliance department dedicated solely to tracking down short-term rentals. Once they are hired, the department’s task force will number five. But Airbnb, the nation’s leading home-sharing company, says its model makes it possible for travelers to experience Miami Beach as locals do. The company favors curbing disruptive behavior, said Michael O’Neil, Airbnb’s director of regional policy, in an interview last month. “The company continues to find ways to be a good member of the community and trying to be responsible and responsive to neighbors,” O’Neil said. The home-sharing company has developed a neighbor tool, which allows people to submit complaints about Airbnb rentals directly on the site. Airbnb says it wants to work with the city to develop “clear, fair rules” to operate short-term rentals and start paying resort taxes — 6 percent in Miami-Dade County plus a 2 percent tourist development tax on Miami Beach — that in turn supports the local tourism industry. While Miami-Dade County has engaged in ongoing talks with Airbnb about a possible tax agreement (about half of all rentals are spread out across 72 ZIP codes in the county; the other half stayed at Miami Beach’s three ZIP codes), Miami Beach Mayor Levine said he has been “approached many times” by Airbnb about negotiating a compromise but ultimately feels short-term rentals don’t have a place in the resort city. Other cities where home-sharing has faced opposition have reached a middle ground with companies like Airbnb, said Mark Lunt, partner in the hospitality and real estate practice at Ernst & Young. San Francisco for instance, where Airbnb was founded, passed a law that allows short-term rental owners in designated areas to register their rentals with the city for a $50 application fee. In that way, the city can keep an eye on its rentals, Lunt said. For now, the fines — backed largely by the hotel industry — are Miami Beach’s only mechanism to curb short-term rental growth. The local resort tax is helping fund increased code-compliance staffing to pursue rental complaints. The fines are endorsed by the Greater Miami & The Beaches Hotel Association, which has worked closely with the city to stop the illegal rentals. Wendy Kallergis, the association’s president, said the prevalence of the rentals is, at least anecdotally, impacting business. 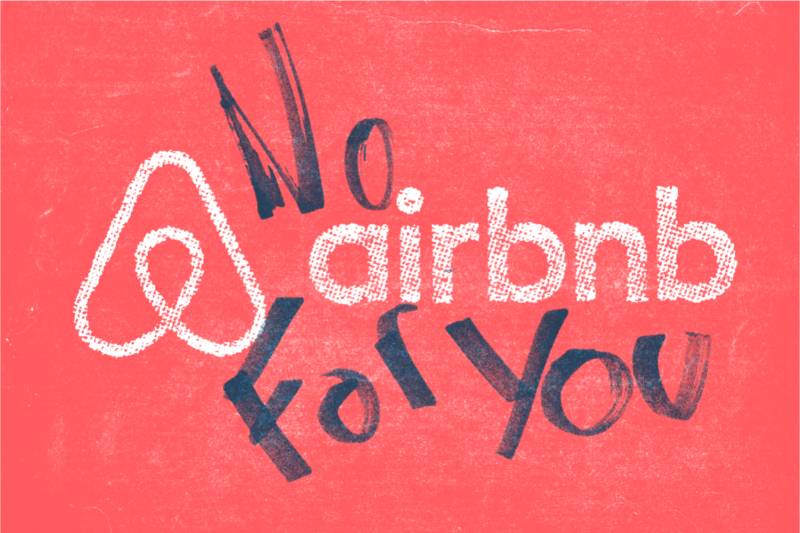 The association supports regulation and taxation for companies like Airbnb — and the fines. “When fines are as excessive as they are, I would hope that it will definitely pay off,” Kallergis said. During peak times like Art Basel on Miami Beach, short-term rentals become even more disruptive for the hotel industry. Hotel rates traditionally crest during this week — a practice that has drawn criticism from art fair participants. An influx of rental options also limits hotels from raising prices too high. “The lodging industry locally is generally not a fan of Airbnb [and other short-term rental companies] because they can’t get those peak rates anymore,” said Lunt of Ernst & Young. That factor was best illustrated during this year’s Summer Olympics, where short-term rentals played a major role in providing the supply needed to house an estimated 500,000 visitors in a hotel room-anemic Rio de Janerio. Miami’s “Olympics,” albeit annual, is Art Basel and the surrounding two-dozen art fairs. Airbnb argues its platform also benefits the local economy because its renters spend more money in the communities they stay in. In Miami-Dade, the average user spends a little more than $250 a day. Short-term rental’s role during major events was illustrated during this year’s Summer Olympics, where companies like Airbnb provided the supply needed to house an estimated 500,000 visitors in a hotel room-anemic Rio de Janerio. The platform hosts a small fraction of the beach’s tourists: Only about 1 percent of all tourists who came to Miami-Dade County last year stayed at an Airbnb rental, according to ZIP Code data provided to the Miami Herald by the home-sharing company. But that 1 percent, plus renters who use other platforms to book a stay in the resort town, is projected to grow. The increase is powered largely by millennial travelers and multi-generational travelers, who are gravitating more toward home-sharing over the traditional hotel stay, Lunt said. Many destinations started the way that Miami Beach is treating it. Better mechanisms have emerged in order to regulate the [rentals]. Mark Lunt, partner in the hospitality and real estate practice at Ernst & Young. Younger travelers want to collect experiences infused with local flavor. Multi-generational travelers want a more cost-effective option for big groups than booking multiple hotel rooms. “[Home-sharing] fits a sector of demand that the hotel business doesn’t meet that well and that’s somewhat exacerbated on Miami Beach because Miami Beach has so many boutique, Art Deco, small room hotels,” Lunt said. As Airbnb nears its 10th birthday, the ripple effect of its growth and the home-sharing industry it made mainstream could trickle into real estate, experts predict. More short-term rentals means fewer housing options — affordable or not — for residents and workers, said Jeff Margolis, partner and co-manager of the Business, Finance & Tax Team at law firm Berger Singerman. “It takes inventory away from those that work and want to live on the beach on a permanent basis and driving [up the rates for] the units that are available for long-term rentals,” Margolis said. [Short-term rentals] take inventory away from those that work and want to live on the beach on a permanent basis and driving [up the rates for] the units that are available for long-term rentals. Jeff Margolis, partner and co-manager of the Business, Finance & Tax Team at law firm Berger Singerman. Airbnb argues that most renters would never put their homes in the long-term market anyway, because most purchased their Miami Beach vacation properties with the aim of renting them out most of the year. The units that potentially could be used as affordable housing tend to be “a negligable amount of the housing stock in a city,” said Airbnb spokesman Christopher Nulty. Instead, the high fines against short-term rentals may lead property owners to rent long-term instead, depreciating the value of the properties because they generate less income from renting, said real-estate broker Ross Milroy. That scenario assumes the whopping fines will stymie the popularity of short-term rental sites. So far, they haven’t. Cardeno said only about $65,000 in fines have been paid so far. Most cases are being appealed. Public sentiment continues to favor sites like Airbnb: According to a poll conducted by David Binder Research of 500 Miami-Dade County residents in August and sent by Airbnb to county commissioners last month, 52 percent of respondents said they had a favorable opinion and 10 percent they had an unfavorable opinion of the platform. And its reach only grows. Between 2015 and 2016 alone, the number of inbound guests to the county via Airbnb rose 30 percent. Since 2014, that number has tripled. The number of existing home sales in Miami-Dade County took another plunge in October, dropping 22 percent compared to October 2015, according to a monthly report released Tuesday by the Miami Association of Realtors.But heavy competition among locals for mid-range homes priced between $300,000 and $600,000 means prices keep going up. Condo sales took a big hit, as developers pump new inventory into the market. Sales for existing condos fell to 983 in October, down 30 percent year-over year. Single-family homes fared better, with the number of transactions dropping by 13 percent to 997. The slide continues a trend that emerged earlier this year. Miami-Dade home sales fell 15 percent in September, 3 percent in August and 21 percent in July. Much of the decline is due to a drop-off in the county’s foreclosure inventory — that’s a good thing because it means fewer people are losing their homes — and a slumping luxury market. A strong dollar has hurt foreign buyers, especially those from Latin America. But a lack of affordable homes ($300,000 and under) is cause for concern, according to the Realtors’ association. Inventory in that price range dropped 28 percent year-over-year. Miami is already one of the nation’s least affordable housing markets. As in previous months, sales were strongest for homes priced between $300,000 and $600,000. The number of transactions in that price category rose 19 percent year-over-year. Overall, median sales prices for single-family homes jumped 17 percent annually, to $310,000. Condo prices rose 7 percent, to $214,000. Brokers have warned that as sales slow down, sellers will need to lower their asking prices for luxury homes. Mark Sadek, chairman of the Realtor’s association board, found optimism in the October numbers. October also saw a drop in home sales in Broward County. 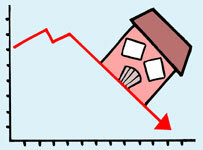 The number of residential transactions there fell 13 percent year-over-year. A ruling from the Third District Court of Appeal found that Florida's law governing terminations, or sale of entire condominium projects, does not apply to older properties. That's bad news for thousands of associations with declarations, or governing documents, predating Florida's 2007 amendment to its condominium statute. It's especially jolting for The Tropicana Condominium Association Inc., a Sunny Isles Beach group battling minority owners over a blocked sale in one of Miami-Dade's most expensive submarkets. The Tropicana association wants its members to approve a sale as developers swarm the neighborhood scooping up modest buildings at top dollar to replace them with glitzy high-rises. But a small group of owners, accused of being straw buyers, moved to prevent potential sales. The Third DCA sided with the minority owners, who argued that the property's bylaws required unanimous approval for a sale, despite the 80 percent threshold in the amended legislation. It agreed that the holdouts' refusal to sell was enough to block the deal, because Tropicana's 1983 governing documents predate the legislative amendment and require all unit owners to approve termination. The appellate court made the decision in a case pitting unit owners at the Sunny Isles midrise against developers planning the neighboring 52-story Ritz-Carlton Residences. The Tropicana condominium association claimed its future neighbor resorted to covert measures to gain control of the modest property as developers swoop in to create luxury projects. They accused Ritz-Carlton developers Edgardo Defortuna and Manuel Grosskopf of using straw buyers to secretly scoop up five of Tropicana's 48 units— just enough to meet the 10 percent threshold for blocking future sales. They alleged the developers sought to prevent rival investors from acquiring the Tropicana, then demolishing the midrise to create a grander building that would obstruct views at the Ritz-Carlton. Public documents link the Ritz-Carlton developers to the companies used to acquire the five Tropicana units. Defortuna, for instance, is title manager for one of the corporations, Tropical Condominium LLC, and Eduardo Klinger, a Grosskopf business associate involved in the suit, also invested in Tropicana. The case turned on the court's interpretation of a portion of the Florida law covering terminations. The amendment allows the sale of an entire property if 80 percent of unit owners agree and not more than 10 percent object. It "applies to all condominiums in this state in existence on or after July 1, 2007." Tropicana argued the law applied to all condos, beginning in 2007, but the appellate court's reading was that it only applied to condos created after July 1, 2007. The Third DCA ruled the statute is not retroactive, so did not govern Tropicana. It found the property needed to amend its bylaws to match the legislation or use so-called "Kaufman language" to specifically state that the property's rules automatically update to reflect legislative changes. "We're very disappointed with that interpretation," said Tropicana Condominium Association lawyer Glen Waldman of Heller Waldman in Miami. "The impacts are huge." Although the minority owners triumphed in the Tropicana appeal, Thurswell Lehr said the ruling eliminates a key strategy for others that rely on the law's prohibition of sales in cases where 10 percent of owners object. In the past, these attorneys pointed to the wording of the legislation to argue it covered all properties in the state. "The argument we like to make is the termination statute offers this protection," Thurswell Lehr said. "But now you have an appellate court basically saying that the amended termination statute does not apply retroactively. You are bound by what's in your declaration." 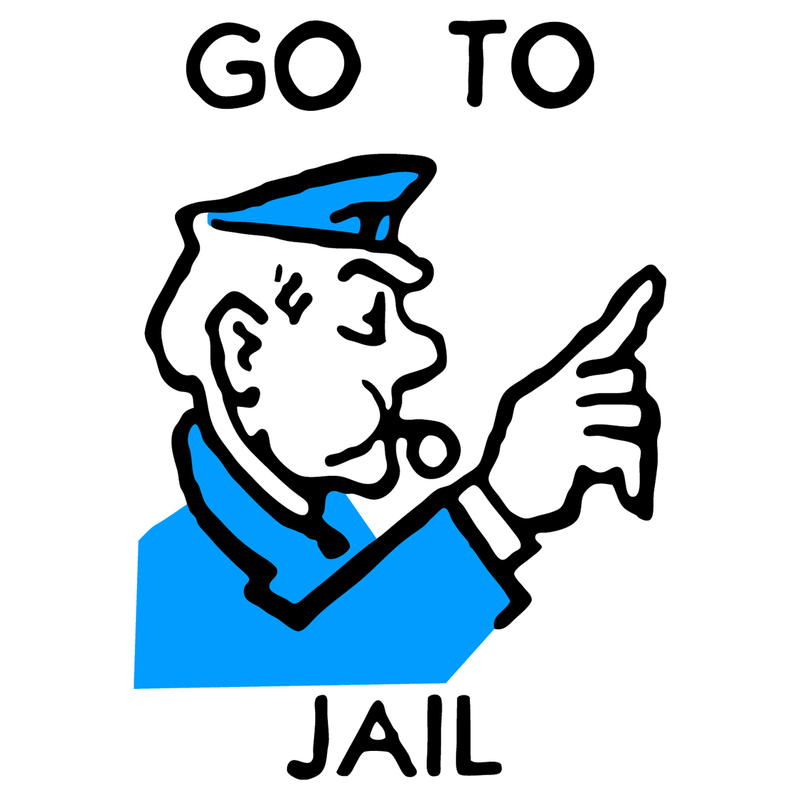 William J. Cox Jr., 61, is facing one count of organized scheme to defraud and grand theft over $100,000. Authorities say Cox and another person stole an estimated $339,507.69 from the Lantana Homes Homeowners Association. A probable-cause arrest affidavit did not disclose the identity of Cox’s alleged accomplice. Cox was released from the Palm Beach County Jail on Wednesday after posting $20,000 bail. He reportedly was the HOA president for 12 years for Lantana Homes, a single-family home community near Lantana Road and east of Jog Road. Palm Beach County sheriff’s investigators say the alleged theft of funds occurred between September 2011 and March 2015, when Cox’s tenure as president ended. An investigation was started in September 2015 when the new HOA president reported discrepancies in the community association’s financial records. The alleged discrepancies included checks listed as payments to one place that were actually written to a trash removal and cleaning company created by Cox. He also used HOA funds to pay personal expenses, including his homeowner’s and car insurance policies, the sheriff’s office said in its report. The HOA’s board reportedly approved of paying Cox’s entire electric bill because he stored equipment — including computers, a postage machine and folding machine — at his home due to the HOA not having an office. The agreement was later revised so that the community association would pay two-thirds of the Cox’s electric bill, the sheriff’s office said. The Miami-Dade County condo market is coming under severe stress, and turmoil is spreading. Preconstruction condos are a favorite playground for condo flippers. They buy the units before construction begins. When the building is completed, some of the buyers (in recent years 30% to 40%) flip their units at a profit, benefiting from the run-up in condo prices in the interim. This activity is crucial in helping developers fund their working capital. Alas, the math has stopped working. The overall condo and townhouse market in Miami-Dade County is already in trouble. In October, sales plunged 30% year-over-year, while inventory for sale rose to over 14,000 units as of November 1, according to StatFunding’s Preconstruction Condo Market Update. At the current sales rate, that makes for over 13 months’ supply. Placing the wrong number of people on the Board of Directors: (Condominium Associations Only) Often times the governing documents do not provide for an exact number of Directors for your Board. Instead, the bylaws allow for a range of directors like no less than three and no more than nine. Florida arbitration cases have held that where the documents provide for a range of directors, the statute automatically sets the number at five. Staggered Terms: (Condominiums Only) There has been lots of confusion over the years regarding staggered terms. To make a long story short, staggered terms are now allowed, if they are provided for in your governing documents and the term is not in excess of two years. Candidate Information Sheets: (Condominiums Only) In a condo election, each candidate is allowed to provide the association with: a copy of an information sheet which may describe the candidate's background, education, and qualifications. This year the DBPR removed the language “as well as other factors deemed relevant by the candidate.” The information contained therein shall not exceed one side of the sheet which shall be no larger than 8 1/2 inches by 11 inches. Any candidate desiring the association to mail or personally deliver copies of an information sheet to the eligible voters must furnish the information sheet to the association not less than 35 days before the election. If two or more candidates consent in writing, the association may consolidate into a single side of a page the candidate information sheets submitted by those candidates. The failure of an association to mail, transmit or personally deliver a copy of a timely delivered information sheet of each eligible candidate to the eligible voters shall require the association to mail, transmit, or deliver an amended second notice, which shall explain the need for the amended notice and include the information within the time required by this rule. If an amended second notice cannot be timely mailed, transmitted or delivered, the association must re-notice and reschedule the election. If the election has already been conducted, the association shall conduct a new election. No association shall edit, alter, or otherwise modify the content of the information sheet. The original copy provided by the candidate shall become part of the official records of the association. Quorum: In a condominium, it is irrelevant if there is a quorum at the annual meeting. As long as 20% of the eligible voters participate in the election, the election counts. When Can the Last Vote Be Cast? In a condominium, an owner can cast a vote up until the first envelope is opened. The association must also have ballots and envelopes on hand. All signs lead downward for the Miami condo market. In the latest Q3 condo market statistics for the Greater Downtown Miami and the Miami Beaches, prices declined slightly by 1.4%, and all other leading indicators are soft; In other words, the market is likely to take a further hit. We are currently at a whopping 24.5 months overall inventory. (Using sales pace from past 180 days, as of Oct. 24.) With this glut of inventory, it is increasingly likely that we will see more downward pressure on prices until the inventory dissipates. When sales slow down and owners are not able to get the price they want, they have two choices: Accept reality and sell for the lower market price or hold on to the property, and wait for a better market. Because of the current market realities, many condo owners have decided to place their units for rent, and thus rental competition has increased. A large number of new construction properties have significant rental availability, which makes sense considering that 70-80% of the buyers were foreign nationals, many of whom don't intend to move in. On top of that, if you have driven through Miami lately, you will see a lot of cranes. What you may not know is that a significant percent of those are for new rental buildings, not condos. With all these rentals, no matter how much demand there may be for Miami, rental prices are likely to see pressure as well. And when rental prices fall, sales prices must follow. One rule of thumb is that when rental prices fall, sales prices fall harder, at about twice the rate. 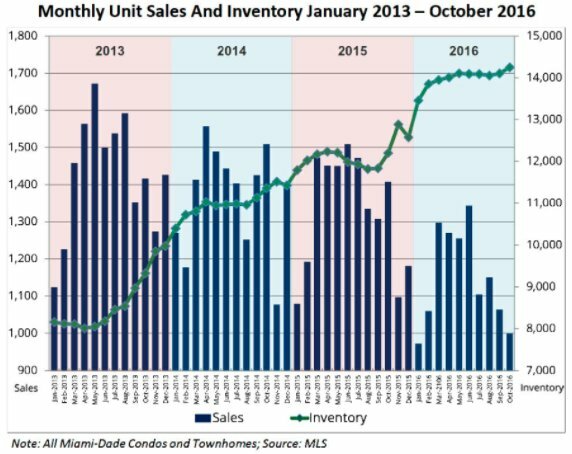 Before the sirens of a bubble burst start blaring, this imminent correction of the Miami condo market is not a repeat of the real estate crash of 2008. We are past the days of lenders handing out no-documentation zero-down-payment loans and developers selling multiple units with 20% down payment. Post Great Recession, cash buyers have fueled most condo purchases, and most developers require 50% down payments from their pre-construction buyers. This has been a long 6-year upcycle of price increases for the Miami condo market, so a normal market correction is a bit overdue. In January of 2011, condo prices in greater downtown Miami and Miami Beaches hit their lowest median sale price of the decade at $163,225, while the median sale price in January 2016 was $325,000, an almost 100% gain in 5 years. Steep price increases of this upcycle have made Miami a more expensive market to buy in, although still inexpensive compared to most major global cities. So where have all the buyers gone? South Americans and Europeans historically make up a big percentage of the Miami condo buyers. In the summer of 2014, the U.S dollar started to climb against most foreign currencies, which started a slow but steady decline of buyers from those continents. From then until now, the euro has lost 36% of its value, the Brazilian real 43% and the Colombian peso 59% against the U.S. dollar. In July, when Wynwood was declared a Zika zone (and then Miami Beach) by the CDC, it became an international story that hasn't quite gone away in the minds of many. While the areas are no longer Zika zones, some potential buyers (and tourists) are still cautious about coming to Miami. Election years are not known to be kind to real estate. And this one is especially disconcerting due to how unusually controversial both candidates are. Many foreign nationals are fearful of what a Trump presidency would mean for them, due to his harsh rhetoric about Mexicans and other comments meant to appeal to his domestic base, not the international community. Given signs of market weakness, there are some buyers waiting on the sidelines. Their hope is that prices drop, so they can swoop in and catch the next wave of price increases when the dust settles. The world looks for reasons to come to Miami. And Miami does not disappoint. Between the new Brickell City Centre mall, Miami WorldCenter, Design District's ultra-luxury retail, Wynwood's art scene, improvements in public transportation and many more exciting projects under way, Miami is an exciting place to live and invest. All people need is a good excuse, and as any of the above become non-factors more buyers will jump back into the Miami condo market. You could put a down payment on a house in Coral Gables with the $70,000 that a London family agreed to pay in monthly rent for a 4,730-square foot Miami Beach condo. The family, whose names aren’t being revealed, signed a seven-month lease for the four-bedroom, six-bathroom unit on the tenth floor of Faena House in Mid Beach. The apartment comes fully furnished with private butler service, ocean views and walk-in closets. “This rental ... is a testament to how strong the market still is,” said Tony Rodriguez-Tellaheche, a broker at Prestige Realty Group, which represented the renters. The eye-popping monthly rent is the highest for a condo in Miami-Dade County so far this year, according to Prestige. Landlord Ashok Khubani, who owns a leading “As Seen on TV” gadget manufacturer called OnTel Products, paid $18.5 million for the condo last year, property records show. Kayce Driscoll of Douglas Elliman represented Khubani. Faena House made headlines last year when a hedge fund billionaire paid $60 million for a duplex there, smashing the record for a residential real estate transaction in Miami-Dade. Board members have an obligation under the law to get certified. You already know how I feel about anyone who signs the affidavit instead of taking a course, and whether or not they should be serving on your Board. Thank heavens that the law provides that you can also get certified by taking a DBPR approved course. I fought hard four years ago to ensure that HOA members had the ability to get certified by attending these classes and am very proud of helping to pass legislation which did just that. I am also proud to say that I have taught the course to approximately 12,000 of you all across the state. At each class, not only do the attendees learn something, but I do as well. So do the attorneys in my firm. Your questions always help raise awareness to so many issues and often times you provide practical answers to what may seem like complicated issues. The bottom line is that we all learn from each other. Whether the issue is budgets, reserves, insurance, year-end financial reporting, your fiduciary responsibilities as board members, the election process, foreclosures, suspension of rights, access to records, arbitration, mediation or even if the new laws that get passed each year apply in your association (the answer may surprise you), we really try to cover it all and a lot more. Our course not only certifies directors, but also provides Legal Update and Continuing Education continuing education credits for community association managers. It’s great to see so many Board members take the course together with their manager. We always serve food and drink, we have assemble a panel of experts to answer your questions, the setting is always first class, and best of all….it’s completely free. You even leave with a summary of everything we just taught. Join us on November 15th, 2016 at the Seminole Hard Rock Hotel and Casino in Hollywood. Doors open at 6:00 p.m. We will be serving food and you get to meet all of our sponsors. Seminar starts promptly at 7:00 p.m.
Or……just download our Condo Craze App on your I-Phone or Android device– and just click on the “Register for Our Seminars” Tab. Once registered, you will get an e-mail confirmation. I really look forward to another year of meeting all of you. It is a true honor and privilege. Miami-Dade County real estate came crashing back down to earth in July, August and September. Sales for existing homes fell to 6,751 in the third quarter of 2016, down 15.3 percent year-over-year, according to a report released Thursday by the Miami Association of Realtors. The condo market was hit particularly hard. Condo sales declined 19.1 percent, compared to a drop in single-family home sales of 6.8 percent. As homes take longer to sell, inventory is rising. The number of homes on the market rose 16 percent, to 20,375 listings. One bright spot has been mid-market homes, those priced between $200,000 and $600,000. Sales in that range were up 10.3 percent. Total sales volume dipped to $2.7 billion in the third quarter, down from $3 billion over the same period last year. But prices, which lag sales as a market indicator, are still going up. The median price for a single-family home rose to $300,000, up 9.8 percent annually. Condo prices reached $217,000, up 8.9 percent year-over-year. A lack of affordable homes for locals is driving up prices as buyers get caught in bidding wars. At the other end of the market, a strong dollar has kept foreign buyers from scooping up luxury properties at the heady pace of recent years. So has increased federal scrutiny of money laundering. Developers have delayed several planned condo projects since the market began sliding. And it doesn’t look like expensive homes will start selling again at record levels anytime soon, said Ron Shuffield, president and CEO of EWM Realty International. The numbers for October, which haven’t been officially released yet, showed about 100 sales for million dollar-plus homes in Miami-Dade, according to Shuffield. That’s down from 145 in October 2015 and the lowest October total since 2011. A strong dollar wasn’t the only thing that hurt the luxury market in October, Shuffield said. Hammocks Community Association (HCA) employee Angie Rose Lantigua and former employee Leslie Navarro have both been charged after an investigation revealed that they had diverted $148,050.17 of HCA funds into accounts that they personally controlled. Angie Rose Lantigua was employed by HCA as the Accounts Receivable clerk between 2010 and late 2015. Leslie Navarro was employed as the Accounts Payable Clerk by HCA between 2008 and late 2015. By creating a bank account utilizing the name “Hammocks Community Association Properties, LLC”, Leslie Navarro was able to redirect HCA funds ($148,050.17) to an account over which she had sole control. The investigation of this bank account revealed that $54, 500 was later wire-transferred to Ms. Lantigua’s personal bank account. 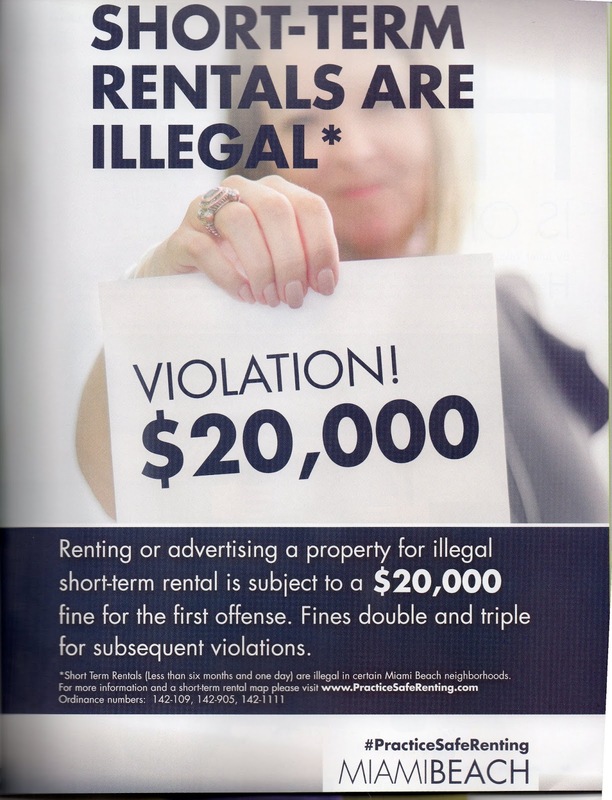 Renting or advertising a property for illegal short-term rental is subject to a $20,000 fine for the first offense. Fines double and triple for subsequent violations. MIAMI - After nearly 20 years and more than 30 complaints to the state with allegations ranging from rigging elections to stealing funds, the so-called “condo crime family” has finally been stopped. Married couple Robert and Rachel Dugger, and daughter Rachel Badilla, pleaded guilty Tuesday morning in Miami-Dade court to conspiracy to commit grand theft, with Badilla also pleading guilty to grand theft from the Kennedy House condo in North Bay Village. Badilla had been charged with forging checks to herself from the association and stealing the money, along with using association keys to enter a vacant unit and strip it of its kitchen and other goods. Ragusa was one of several condo residents who came to watch the family members plead guilty to their crimes – and she wasn’t alone in her disappointment that they weren’t given jail time. The trio instead were sentenced to five years probation and 300 community-service hours, and ordered to pay more than $500,000 in restitution and other costs. Perhaps most importantly for the condo residents, Judge Alberto Milian also ordered them to surrender their condo-management licenses and cease all condo work in the state of Florida within 10 days. If they violate probation, the Duggers face up to 15 years in prison while Badilla could spend up to 35 years behind bars.